In 2012, Heaven Hill Distilleries in Louisville Kentucky decided to re-create a vintage wheat bourbon originally named Old Fitzgerald, using the original distilling method but with an updated taste profile. 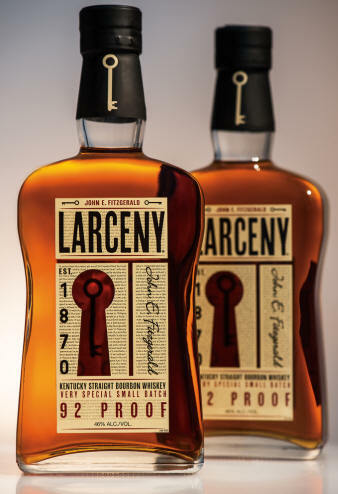 John E. Fitzgerald's "Larceny" was born. A campaign and story is created directly from the packaging design. The design features a die cut keyhole with inset key to go along with the "legend" of John E. Fitzgerald. Revealed in a family biography of Pappy Van Winkle, John E. Fitzgerald was not actually the man he has always been portrayed as. He was in fact a bonded treasury agent, who at the time were the only people legally allowed to carry the keys to the barrel storage warehouses. Mr. Fitzgerald apparently had a particularly discerning palate for fine Bourbon, and would use his warehouse keys to gain access to the best barrels, which eventually became known around the distillery as “Fitzgerald barrels”. Herbst, and then Pappy, immortalized the man who had both the keys and the fine taste by naming the brand Old Fitzgerald.